Lee Murdock has uncovered a boundless body of music and stories in the Great Lakes. There is an amazing timelessness in this music. Great Lakes songs are made of hard word, hard living, ships that go down and ships that come in. Noted as a fluent instrumentalist, Murdock’s musical influences span fifteen generations, combining ragtime, Irish, blues and folk styles with his flair for storytelling in songs. Making folk music for the modern era, Lee Murdock’s work is a documentary and also an anthem to the people who live, work, learn and play along the freshwater highways of North America. Broadly acknowledged as “the premier interpreter of songs and tales about the Great Lakes,” Lee Murdock has uncovered a boundless body of music and stories in his home region. His research into the music is grounded in the work song tradition, from the rugged days of lumberjacks and wooden sailing schooners, Murdock comes alongside with original ballads of contemporary commerce and revelry in the grand folk style. To listen to Lee Murdock’s music is to visualize the long, heavily laden deck of an iron ore freighter being tossed by malevolent waves, to envision a choir singing, feel a lover’s lament, nurture a love for an isolated shoreline … and much more. Murdock has been compared to the late Canadian songwriter, Stan Rogers, with a singing voice and a respect for musical traditions that is reminiscent of the great Burl Ives. Indeed, his repertoire is a seamless blend of the old work songs, mixed with his own original compositions and the work of songwriters such as Shel Silverstein, Woody Guthrie, Pat Dailey, Larry Penn and others. On the traditional side, Murdock draws heavily on the archives of authentic sailing songs collected in the early twentieth century. Housed at the University of Michigan, Professor Ivan Walton’s collection of songs of the Great Lakes sailors was unpublished until 2002, when Detroit journalist Joe Grimm completed Walton’s work, published by the Wayne State University Press and titled, Windjammers, Songs of the Great Lakes Sailors. Murdock’s contribution of the musical scores to the text filled a long-missing link in North American folklore and song. While other musicians have revived some of the songs collected by Walton, Lee Murdock has been the primary artist in bringing these songs to life, and audiences have readily embraced these new, “old” songs and asked for more. “The discovery of this vast collection of American maritime music was amazing to me,” says Murdock. “And to think that it exists over 1000 miles from any salt water.” Murdock blends the traditional songs to appeal to contemporary musical tastes, reaching out to new audiences with his stories and songs from the inland waterways. Bringing a deeper understanding of the folk process, Lee’s repertoire combines historical research with contemporary insights. Making folk music for the modern era, Lee Murdock’s work is a documentary and also an anthem to the people who live, work, learn and play along the freshwater highways of North America. As a school assembly performance, Folk Songs of the Great Lakes Region brings history to life in a very entertaining style, as he tells the stories, in song, of the brave pioneering spirit of the people who settled the Great Lakes and the Midwest. This 50 minute educational presentation integrates the arts with curriculum in music, history, language arts, and environmental education, at any grade level. (Although it is ideal at the 3rd or 4th grade level in the study of local history, or as adapted for junior high and advanced students). The Program traces the history of the settlement of the Great Lakes region, including both maritime history and songs and stories about the people who settle on the Great Lakes shores. Includes songs from farming, lumber trades, shipping, building of the canals, women’s roles, family life, legends and heroes. Lee Murdock has released sixteen CDs and two books since 1980, and all of them have been met with strong radio airplay across the USA and Canada, and some parts of Europe. No two concerts are alike, because Lee likes to customize his repertoire to reflect the songs of the region he’s visiting, or to coincide with historic anniversaries or contemporary insights. Lee Murdock has uncovered a boundless body of music and stories in the Great Lakes. No two concerts are exactly the same. Lee selects songs appropriate to concert locale, regional history, or even simply to satisfy audience requests. Like the Great Castles the lighthouses on the Inland Seas. Lee’s songs and stories share the tragedy and the heroics, the isolation and the beauty and the drama of lighthouse lore and the Life Saving Service. Especially popular for libraries and senior citizen groups. A narrated concert featuring songs of supernatural legends and spooky tales of ghost ships and haunted lighthouses. The perfect fall program for libraries and museums. A holiday concert commemorating the turn-of-the-century tradition of carrying Christmas trees to ports on the lower Great Lakes. This was the final cargo of the season during the lumber schooner days, after the last of the logs from the northern forests were hauled south to build the cities of the Midwest. The Rouse Simmons was but one of many ships hauling this cargo, though perhaps the most famous and beloved ship of her day. Using folk songs to tell the story of commerce on the rivers, canals and Lake Michigan’s shoreline in Illinois, Lee Murdock traces the rise of shipping in this state, from the days of keel boats, through to today’s 1000 foot Lake freighters. In old songs and new, he sings of lake schooners hauling grain and iron ore, famous river packets delivering their goods and passengers, and the canal boatmen who navigated across the Illinois prairie. He speaks to the shift in shipping technology, from sailing craft to steam powered vessels. Lee tells of heroic deeds, comical characters, and the beauty of our state’s waterways. In about an hour, Lee Murdock sings and speaks the language of the river rats and schooner-men, the lighthouse keepers and fisher-folk, the modern day sailor and the environmentalist. Be ready to join in the boisterous chorus of a popular Irish Pub song, share the sly joke in classic old ballad, follow along to a soft instrumental air or vigorous dance tune from the Emerald Isle. Follow the Irish across “The Big Pond” with songs of Irish immigrants, as he celebrates with an anthem honoring those who labored to build the Illinois and Michigan Canal, or traditional tunes from the Beaver Island settlers and more. 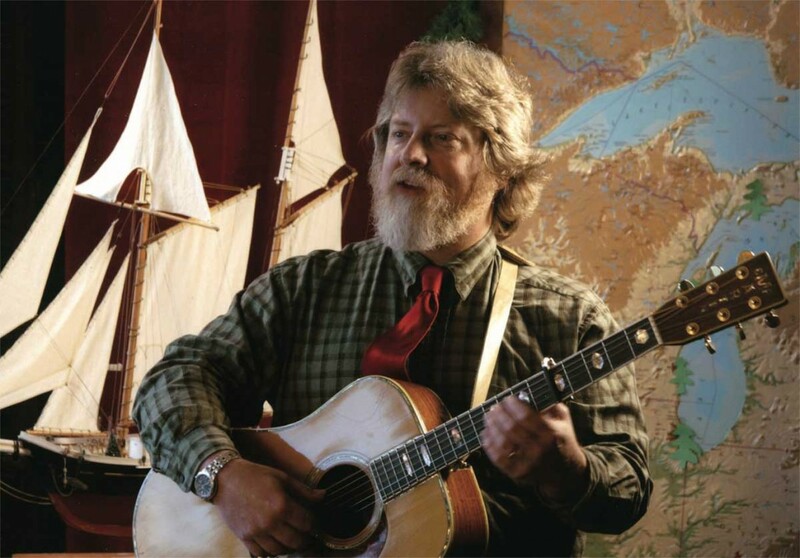 Developed for the Prairieland Chautauqua in Jacksonville, Illinois in 2011, Lee has researched, collected and written songs and stories of the Midwestern experience during the Civil War. In the summer of 1812, war was declared with England by President James Madison. Why? Cargo and crews of the US merchant fleet were being seized or impressed on the high seas by the British Navy. Native peoples were encouraged by British agents to rise up in rebellion against American settlers in the Old Northwest Territory. American interests coveted the vast expanse of the Canadian frontier. Historian and folk-singer Lee Murdock revisits the history of this forgotten war with songs from the period, as well as contemporary ballads that tell of battles, characters, poetry and heroic deeds performed on both sides of the conflict. It is a musical lecture that not only celebrates a turning point in the history of Illinois and North America, but also the alliance between the US and Canada that has been nurtured for almost two hundred years. Experience the work in the songs adapted by the sailors and crew on Great Lakes vessels during the days of sail. An opportunity for everyone to join in song, and to feel the work that was made easier by these call-and-response songs. Workshop: Instrumental Guitar Techniques (Fingerstyle, master class). New: A multimedia presentation with live music and visuals (projector/screen required).